From 16th Jan. to 15th March. Located in a closed and quiet road where it's easy to find parking, from which quickly reach the shopping area. A double bedroom with air conditioning and a double room are at disposal for the guests. 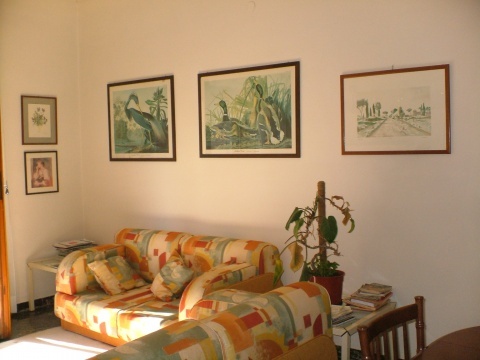 The b & b Monteverdi is located on the second of a three-story building located in one of the most beautiful areas of the city: the residential zone of the District of San Benedetto. In fact the b&b takes its name from the homonym via Monteverdi, closed road and quiet where it's easy to find parking, from which quickly reach the shopping area. The structure can be reached in 20 min. from Cagliari Elmas airport or in 10 minutes from the port or from the train station of the city and is just a 3 min. walk from bus and lightweight. A double bedroom with air conditioning and a double room are at disposal for the guests. The rooms are furnished in a simple, but functional. The bathrooms have been renovated at the end of 2009. At breakfast there are no limits of time and are available: coffee, tea, barley, milk, croissant, jam, butter, cheese, salami, panfette, fruit juices. -the regional natural park of the Molentargius lagoon, an important area for wildlife protected, birders paradise and lovers of nature where you can admire the beautiful pink flamingos and dozens of other species of birds. -Poetto beach and Calamosca where enjoy splendid days of sun and sea.